Hey all! Hope you guys didn't already forget about the Kingdom Hearts 3D [Dream Drop Distance] Ultimania already because there's still many more secrets left within it that we've yet to discover! The lovely goldpanner has begun translating the staff interviews, total 22 in all! There are slight spoilers for story and gameplay so please read at your own risk! We'll be updating this post with as time goes by, so check back often! You can read it below by clicking [Read More] or by visiting us herein our forums! Q. What did you find difficult in programming for the 3DS? A.The 3DS has 3D-vision was well as top and bottom screens, and on top of that, there were many terrains that had to be broadened, it was fairly difficult to realise the performance necessary to bring the Flowmotion in this title to life. Nakamichi (Mr. Masashi Nakamichi) did his very best for me in that area, and I believe that consistently the action we made feels good and the graphics are colourful and flashy. Q. Are there any elements that came from ideas put forward from the programmer's side? A.There was a period where we were sweating blood because the design of the ‘Flick Rush' game just wouldn't gel, and from an enthusiastic exchange between the planners and the programmers in charge of the task, I think it ended up coming together very nicely. Q. What was the biggest hardship you faced? A.Producing a new title in about one year was extremely difficult. We were able to appropriate the gameplay from KH BbS to a certain degree, but there were also many new parts we had to make, and there were also hardships involving making it possible for work on the planning side and programming side to progress simultaneously. I was actually doubting we could complete it in one year, so the early stages of development they whittled down many specifications for me, but as development progressed new specifications were added on, and in the end the volume exceeded what we had original planned. I am so grateful to my brilliant tough staff who managed it. Q. If you have an unforgettable memory from during development, please share it with us. A.When we were submitting the master ROM, there was a severe bout of influenza going around, so I told all the programmers to take care. However, four days before we were to submit the master ROM, I alone caught it, and not being able to be present for the most important moment was an incredibly crushing memory. I'll never forget it as long as I live. 3DS memory capacity is comparatively large, and because in the early stages of development I ran my mouth saying things like ‘we still have this much we can use,' in the last half of development we had a lot of trouble making ends meet with memory. A.Creating the system that would allow all the scenes to be viewed in 3D without falling apart was very difficult. If there are errors in the graphics it will be exposed in the 3D picture, so I had to fine-tune it over and over. Q. If there was something you fine-tuned in order to make use of the functions of the 3DS, please share it with us. A.It has top and bottom screens, so I tried to come up with ideas that made use of both screens, like Reality Shift. Q. What was the most difficult part of production? A.I took care to create a sense of unity with the KH Series, making sure I was able to reproduce the representation and look of KHI and KHII on the 3DS without a sense of incongruity. A.The development period was comparatively short, and the designers on the planning side began planning data early, so in the beginning, both the data planning and the gameplay planning on the programmer's side were going at the same time. Because of that, the process went backwards to how it normally goes, with data being made and then us creating systems to express it on the 3DS afterwards, that was very difficult. A.New hardware, new title, short development period; there was always a feeling of tension on this project, and I think the memory of the entire time is something I'll never forget. Thank you to all the many people who worked with me. Q. What is something about this title you particularly want people to see? A.Using Flowmotion you can get to many places on the huge maps, so I hope people enjoy searching around. In the cutscene from Xehanort's perspective that runs right after the opening of the game, we had to make his head smaller so it wouldn't show on the camera. Looking at it from another perspective you see he has a normal body with a tiny little dot of a head on top, it had me in stitches. It's such a shame I can't show you. Q. What did you worry about in terms of the interface? A.Adjusting the space between icons and text etc. in measurements of one dot, trying to display a good deal of information without it feeling cramped or the lettering becoming hard to read. Q. How did you come up with the idea for the Spirit growth screen? A.To match the Spirit's colourful bodies, we went with cute colours and rounded designs for everything. We also went with the touch screen as the main controls, because we wanted people to feel they could touch the Spirit directly and enjoy getting close to them. A.Finding how to fit so much information on the screen. Especially the bottom screen, where you have to make the buttons large enough that they are easy to touch. As a screen with a large volume of information, it was very difficult to balance functionality as a touch screen. A.The Interface staff were also involved in designing the Dream Eaters, so we would love people to see and enjoy the Spirit growth section. It's even fun to just watch them moving around on their own inside the screen, so please try playing with your Spirits more and more on the growth screen. I'm sure many people have noticed, but Meowjesty's colour and design includes a black body, lines along the brow, red pants, yellow feet... like Mickey. A.There were many worlds appearing for the first time in the series, and so as I worked I watched DVDs of the original works over and over listening to the lines and adjusting things to make the atmosphere as close as I could. It was a huge job. Q. What's your favourite line? A.The conversation between Sora and Riku on Destiny Islands that you hear in the opening of the game. They're the same lines from KHI, so during recording I listened to the voices from KHI for reference as I worked. Those lines had been recorded in that exact studio around ten years before, and I was recalling those days and reflecting on the ten years that have passed. Q. Were there any voiced parts that were cut for some reason? A.With the KH series we record lines while looking at a storyboard, and then the cutscenes are made after that, you see, and with this title they planned the cutscenes with the goal to ‘use all the recorded lines!'. Thanks to that, character's movements were adjusted to suit ad-libbed voices, and I didn't have to shed a single tear over a line getting cut and shelved! A.The same members have worked in the KH series sound team for many titles now, so even if the production time is short, we band together and back each other up... though in my case I was just receiving back up (laughs). My best memory is how we could all have so much fun working together! It took five months in total to record the voices, but the last recording was done a month and a half before the development deadline! I was pretty scared because it was the first time I'd cut it so close, and I am relieved now it's managed to reach you all. Q. What was the theme you most wanted to depict in the story of this title? A.The bond between Sora and Riku's hearts. Sora and Riku have to be separated at the beginning of the story, but the bond between two hearts that trust each other closes the distance between the two of them and causes them to impact on each other. Q. If there was something you came up with to make use of the functions of the 3DS, please share it with us. A.The 3D for cutscenes is delicately tuned. Some thought that the subtitles were difficult to look at, so this is the first game in the series that provides an on/off option for subtitles. Q. What's your favourite cutscene? A.The scene talking with Xehanort from Sora's perspective, at the beginning of Side: Sora's The World that Never Was. Particularly the part in Traverse Town, because Sora is looking around and running, and coupled with the 3D I think you really do get inside Sora's feelings. Q. Where there any rejected cutscenes? A.Not rejected as such, but in the beginning we planned the battle with Rinzler in The Grid to be Side: Riku. Before the start of that battle they announce the ‘thirteen combatants', and though we didn't consciously choose the number ‘13', changing it to Side: Sora gave it an unexpected deep meaning. A.I really want people to try out the 3D vision and see the Disney and KH characters depicted in 3D. But of course only as much as won't tire their eyes (laughs). Q. What do you want to challenge yourself with in the next title? A.When you think of Disney of course what comes to mind is the songs. I want to try writing a scenario that incorporates musicals and songs. In The World That Never Was, there's a scene in which, if you don't fulfil the prerequisites, Riku is forced to drop (see p.216). For this scene Mr. Mamoru Miyano who plays Riku ad-libbed four patterns for us. It's not in the theatre so please, fans, try not to miss it (laughs). Q. If there was anything you included with special intent, please share it with us. A.Being the ten year anniversary, I wanted to put more energy into the opening movie for this title than anything so far. Of all my projects KH is the one with the most pressure and I intended to put my heart into being true to everyone's hopes. A.With the Mickey in the opening movie, I was introduced through co-operation with Disney to animation supervisor Mr. (Nobuo) Tomisawa, and we were able to bring to life that depiction in traditional animation. I believe that the opening movie we created, viewable in 3D as well as using both top and bottom screens, made full use of the functions of the 3DS. A.The scene where Destiny Islands becomes a pop-up picture book. In the role of unskilled leader of the staff of Square Visual Works (studio in charge of movie production) I asked for design and gimmick plans. The drive and determination was incredible, I was very happy to be able to watch them grow. A.Even with the pressure, I had a lot of fun developing. I came to the office alone on Golden Week and worked happily listening to the orchestral version of ‘Hikari' turned way up loud in the dark (laughs). A.The art of graphics has very much evolved, and so I'd like to try producing realtime graphics in movie quality. Also, this is just a dream or a wish, but I'd like to try doing a full-length KH movie. During production I received a phone call from (Mr. Tetsuya) Nomura, and he told me he wanted me to definitely make sure to alter a particular scene. When I asked the reason, I remember my astonishment at being told so quickly the shocking story. Q. For production of this title, what sort of maps did you think of making? A.In this title Sora and Riku's movements are dynamic, so they can move a long distance in one action. On a small map they would be able to go from end to end right away, so when we made the maps we took care to incorporate play elements into them and made them as big as possible. Q. What is your favourite map? A.No matter which map I think of I like them all, but if I was forced to say, I'd say Traverse Town's post office, perhaps. The platforms have hugely varying heights and there are many rails set up so you can ‘rail slide', which made it feel refreshing to play, and I think to look at it is all arranged very cheerfully. Q. Which map was difficult to bring to life? A.The World That Never Was. There are many maps that change form, with chopping buildings and going upside down, so it was a huge job to optimise the memory and graphics processing. A.Making the polygons used to express the proper look of the glass in The Grid etc. show translucence. There are many restrictions on translucent polygons, and as it was there were flickers meddling with the technique's effect and it coming out looking weird. In order to make it look natural we had to make full use of subtle techniques. A.One characteristic of the KH series is the completely different touch to every single world's setting, so I would like for people to enjoy the different flavours in that regard. We finished this game to feel like a ‘portable Disneyland', so please play it forever. On the world map, the unopened worlds are made so that you can't see what's in them. I thought of the design when I was drinking bubble tea. There are black bits swimming around inside, please check it out for yourself. Q. What's your favourite map? A.The first one we drew up, Traverse Town's fourth district. The basic themes for Traverse Town maps so far were composed of straight lines, so for fourth district we used many curves. The passageways give the impression of narrow back-alleys, but if you climb to the rooves you can see a spectacular view, with all the decorative lights and the colosseum visible in the distance. Also, the passageways and rooftops differ in direction routes and actions you can use, which was fun to create. Q. What sort of influence did the addition of Flowmotion have on map design? A.The possible length and breadth of movement is incredible, so we had to make big maps in response. Because there are more levels, the navigation map changes to fit, too. We did our best to make it change for even tiny places nobody would notice. A.Setting up the plains with changing weather in Symphony of Sorcery was very difficult. A huge volume of data must change all at once the moment the weather changes, and until it was put in place the everyone in the section each told me ‘we can't see the completed shape at all'. I don't really remember what we did to get it the way it is now. Q. What part were you most particular about producing? A.Sora and Riku move quickly, so we decided to make the scope of the map much broader than in past titles. However, if all we did was made it broader it would have been boring, so we came up with ways to change the scenery and atmosphere to fit. This in turn increased the amount of data, which put a burden on the BG designers, but through everyone's individual efforts we were able to bring it to life without a drop in quality. The eyes of the clown set up in the secret tunnel in Prankster's Paradise always follow you. It feels pretty creepy. Q. Who's your favourite character? A.The characters from The World Ends With You, because I was involved with them. I never thought I'd get to see them in 3D so it was new. I'm sure many people were surprised about that too? Q. Which is your favourite Spirit? A.It's trite, but I'd have to say Meow Wow. When I first saw it, my impression was ‘that's a weird character that doesn't feel KH-like at all!' but it was given movements, and then given noises, and step by step as I watched I became completely taken by it. Of those I designed myself, my favourite is Escarglow. It's not very strong, but I hope you will go easy on it for me. Q. Are there any Spirits that were cut? A.Many. There were lots of plans, from a dolphin and an alpaca to things I don't even really know what they were. A portion of those is what remained by the end. Q. Was it difficult to make over fifty distinct Spirits? A.There were lots of ideas coming in at the beginning, but yes, the last half was pretty painful. The staff members on the three-person team drawing the Dream Eater design plans other than myself were female, and because they were very good at the cute designs, if I had to I'd say which, I ended up in charge of the cool ones. Q. Did you have ideas for elements that could change the outward appearance of the Spirits other than the Paint Gun? A.In the early stages of development, we also had the idea to have the Spirits outward appearance change as they evolved and got stronger. However, it was brought up that ‘do we really want Dream Eaters we made cute on purpose turning all manly? ', so we decided not to have them evolve. The basic Nightmare eyes are scary, round and red, but we left it off one breed because it was too scary. Can you tell which Nightmare that is? Q. What was the concept for the effects for this title? A.The concept was, just like the story, ‘dreams'. In the early stages of development, things basically associated with dreams came up as effects. After deciding to use a 'kaleidoscope' motif for the keyholes of each world, I think it was comparatively easy to solidify the imagery. Q. Were there any changes due to the picture being in 3D? A.Maybe the biggest difference was, if for example you are to show something far away in a cutscene, in 2D picture like we've had up until now, instead of placing it far away you can make it smaller so it looks like it's far away. However, you can't use those sorts of tricks in 3D. A.The production time for this title was especially short, so we had to come up with ways to be able to work well-efficiently while maintaining the overall quality. Also, it's a characteristic of the 3DS that the parts where effects overlap go white, so we had to pay close attention to adjusting the colour saturation. Q. If there was one, please share with us a funny episode from during production. A.For the ‘Lucky Dice' Link Attack with Ashika Juggler you roll some dice and if you're lucky you attack, if you're unlucky you take damage, and once I got raging mad because no matter how many times I rolled the dice the same number kept coming up thanks to a bug. A.It's not the highlight of our effects, but after the opening of the game and after fighting the Ursula illusion, in the scene where Sora and Riku fall into the ocean, the brown-robed man flickers on the surface of the sea. I wonder if a lot of people missed it...? In a particular spot, Mickey uses a magic spell called ‘Stopgan'. This doesn't mean ‘Stop Gun'; it is the -gan level of magic, one step higher than the -ga level. It's the same as ‘Zero Gravigan', the level higher than ‘Zero Graviga'. A.Tamasheep. It's attacks are slow, I guess really like the way it's gentle and frail. Q. How much did you reference the original animations and films? A.For characters appearing in battles, in trying not to ruin the image from the original works, I referenced every nook and cranny of the original works. And then on top of that I adjusted the speed and movements to match the game's tempo. Q. How did you come up with the Spirit's motions? A.When I first saw Flowmotion on-screen, which was included from the early stages of development, I was surprised. From there, a good deal of hardship went into the trial and error in meeting (Co-Director Mr. Tai) Yasue's request for ‘invigorating free-flowing action'. Q. What part were you most particular about in producing? A.The Spirit's expressions when they were happy or angry while making friends with you. The model team and the programmer team did me an impossible favour and gave the eyes and mouths the ability to have expressions. Meow Wow has some walking motions we had to shelve because they were too slow to use in battle. There was a bouncing motion I really did love. Q. Was there something you had to be careful about when making the character's movements? A.Although the story is set after KHII, in this title Sora and Riku return to the way they looked when they were young boys, so I was careful to try not to make their movements revert to KHI too much. Riku in particular has trimmer thighs in his new clothes, which means his basic movements like walking and running are closer to KHII. A.There were many scenes recreated from the original work, so I referenced them quite a bit. However, recreating the Disney films was difficult in many ways. In the scene in La Cité des Cloches where Quasimodo goes from the cathedral to the plaza to save Esmerelda there weren't enough building walls to get a run-up like in the movie, so it was an extreme struggle to make. A.There was a fairly large number of cutscenes for such a short production time. The cutscenes towards the end of development were all huge volume, and then when I was told on top of that ‘there's going to be the longest cutscene in the KH series', I thought ‘well that's a lovely dream...'. A.(Mr. Tatsuya) Kando (director of The World Ends With You) had a strong attachment to the characters from The World Ends With You, and I'll never forget how he checked them over and over. He said ‘Rhyme's way of walking is cuter!' and demonstrated for me. I just had to laugh at how funny he looked. Because Riku's head looked bigger with shorter hair, we made his head a little bit smaller. Also, the Keyblade he wields is upside-down from how it has pointed up until now. We changed it because unlike with the Soul Eater the grip-part was sinking noticeably through his wrist. Q. Which parts were you in charge of the music for? A.Field and battle music for all worlds except The Grid and Symphony of Sorcery, the theme for the last boss, and others here and there too. Q. Please tell us about the concept for the music of this title. A.Dreams!!! And then, because of ‘3D' I consciously used a little triple metre. Q. Please tell us about the concept for the version of ‘Dearly Beloved' that plays during the title screen in this title. A.As you'd think, ‘triple metre'. Is that too simple? (laughs) I was like, I want to put in a little taste of a merry-go-round sparkling twirling in a dream, at night. Q. What was the most difficult track? A.Traverse Town, I suppose. I thought it would be fine to use the one from KHI, but they told me they wanted a new track with nuances left in from the KHI track and I was stuck. But I was like this is Traverse Town we're talking about, it has to be that! And so it ended up the way it is now. A.If I'm forced to say, it would be the group of tracks appearing towards the end that use past melodies. At first they look like completely different tracks, but in reality they have the same rhythm and such, I thought of various ways to remix them. Do I want to expose it from the start or not... that sort of thing (laughs). A.When I was recording the piano data for the track called ‘L'Eminenza Oscura I' (slowing the tempo, of course), my nail got caught and I hurt my finger but I went on playing anyway. It was somehow weirdly high tension! I put it on twitter*, but during composing, part of the data looked like the ¬_¬ emoticon. It was on the track called ‘Broken Reality'. The melody has a few too many gaps (laughs). (Translator's Note: you can see her picture here). A.The themes related to Dream Eaters and Dive Mode. Q. What kind of request did the directors make? A.They said they wanted ‘emphasis on the KH feel, without feeling too serious', which sounds simple, but orders like that are surprisingly difficult. I was very nervous, like I was being tested (laughs). A.The track called ‘Gigabyte Mantis' that plays during Riku's battle with the Ele Kumakiri Dream Eater in The Grid, where synthesiser and arpeggios of the decided tone row are repeated to emphasise the digital atmosphere, and a few acoustic instruments are incorporated to bring out the KH feel. I paid very close attention to the balance in that regard. A.During recording for one particular instrument, the performer pointed out a mistake I'd made in the sound, but I knew it wasn't really a mistake. ‘Ooheehee!' I thought to myself. Ooheehee (laughs). A.The phantasmagorical attacks of the Dream Eaters are wonderful. I think the finished battles have a great atmosphere, music included, so please enjoy it! Out of the two arrangements of Ms Shimomura's pieces we first prepared for use in Dive Mode, one of them ended up being used as the theme for the last boss!! A.I mainly arranged the tracks from The World Ends With You that were used in Traverse Town and the themes for The Grid. A.The directors requested this too, but the KH series has fans from a broad range of age groups, so I went with arrangements that were easy to tell and enjoy. Q. Were you careful to differentiate your tracks from the other two composers' in any way? A.The scenes I was in charge of needed individuality, so they naturally are different. I personally didn't use any orchestral instruments, so I think you can feel the difference between the works by the other two. A.The arrangement of ‘Twister' that plays in Traverse Town. I particularly re-recorded the acoustic guitar live myself. A.It's doing what I love so I don't think of anything as a hardship. A.I had a hard time with the strong image of the music from the movie in The Grid, but I was particular in making it in my own special way. A.The cutscene where Neku makes his entrance. A.In the recording studio, (Synthesiser Operator Mr. Keiji) Kawamori suddenly appeared with a bag from a certain coffee chain store for me. After that he ate and then left. Finding a vocalist was harder than finishing the tracks. There aren't many good singers who can also sing in English, so I searched online and called people out of the blue and tried all sorts of things. The result is what you hear. Q. Was there anything different about making sound effects for the 3DS hardware? A.The hardware's efficiency was higher, so I was able to produce the highest sound quality in the series. The cutscenes in particular were finished with a sound very rich in expression. I'd love for you to play with headphones on. A.Every time, the KH sound team hold a session to watch and discuss the original Disney work. The hardest thing in this title was Symphony of Sorcery. The original film, Fantasia, was an animation with no voices or sound effects, only classical music. It was incredibly hard to reflect that in a video game, but it ended up a world in which the BGM was played by various instruments that became sound effects by the protagonist, so please play it and see, and enjoy. A.The sounds the Dream Eaters make. Unlike what you'd call a real monster, they look cute in a dorky ugly sort of way, and on top of that they can also become your friends, so we had to make original sounds for them. We made an audio manufacturing tool called the ‘DE (Dream Eater) voice creation tool' and, using various materials, made original sounds for them. A.I was on a diet, but it was popular among the sound team to bring in sweet food to share, and I ate away without paying attention to weight gain (laughs). Despite the development period being so short we had excellent teamwork again on this title. I am so grateful to the development team I relied on, the sound team who shared my hardships, and all the fans who always play our games for us! I hope you'll continue to follow the KH series from here on, too. In Symphony of Sorcery, no matter which Keyblade Sora or Riku have equipped, the fight sounds change to the sounds of musical instruments. It doesn't change with the strength of the weapon, so please don't worry. Q. What did you pay attention to in order to continue the imagery from past works in the series? A.I paid attention to the image gradient needed to smoothly show the shapes common to the series. There are many things particular to the KH series, and on top of that the development period was short this time, so it was a huge job, but despite that I think the end product was the very best we could have done. I am hugely grateful to all the production staff. A.There was a plan to have not just the colour but patterns and such customisable for rare enemies. Unfortunately we didn't adopt this, but it was very cute. A.There were many Dream Eaters with changing colours on their bodies... such as hands and feet going from blue to yellow from the base to the tip, which was very difficult to depict. You'd want to draw a shadow on the bottom half of their body, but the further down the body you'd go the brighter the colours would be, that sort of thing. Also, a characteristic of the 3DS hardware is that red is a little difficult to make show, so I had to pay attention to recreate the fine tints in the design plans. A.Sorcerer's Apprentice Mickey. For Spirits, it would be out of Meow Wow, Yagi Horn, Hasami Kuwagata and Aura Lion. A.When you are choosing cutscenes in the ‘Theatre' in ‘Memoire' in the camp menu, the picture that shows up is actually also in 3D. The face of the polygon model of Ventus that appears in this title is, strictly speaking, different to the one from KH BBS. The one in KH BBS was subtly altered from Roxas' face, but this time, in order to increase efficiency on motion work, we used the same model for Ventus and Roxas. A.The characters from The Grid were from live-action, which I hadn't done for a long time, so I put a lot into each of them. It also felt quite nostalgic changing Sora and Riku's costumes and keyblades to look native to that world, so it was fun to create. 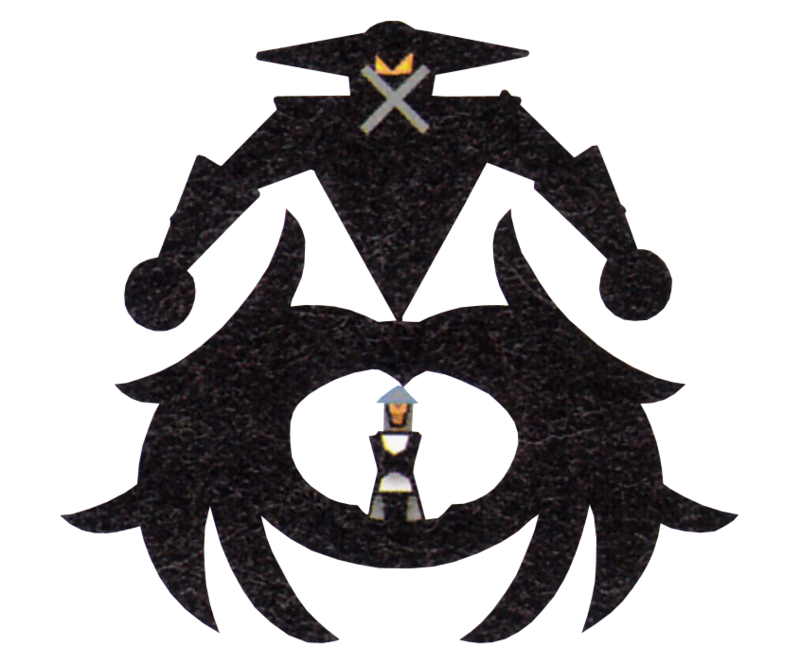 A.In the development phase, they were thinking of making the enemy Riku fights in The World That Never Was as a symbol of Sora's nightmare a Nightmare version of Meow Wow. In the end they decided on the Anti Black Coat, a black-coated person with the red eyes of a Nightmare, but I personally wanted to leave in the look of the Nightmare Meow Wow, so the colouring on Anti Black Coat's black coat matches Nightmare Meow Wow. By the way, the pattern on the black coat is, on (Mr. Tetsuya) Nomura's suggestion, the same pattern as the one around the keyholes of sleep. A.Actually, in early stages of development, Meow Wow had a different colouring. I liked it quite a bit, and even after it was cut I kept the data close at hand, but I get the feeling it will for all eternity never see the light of day, so I'll take this chance to show you, please take a look. During development, Naru Bird's nickname was ‘the cool bird'. From little appointments to big meetings we always called it ‘the cool bird', so I was a little relieved to see an official name in the game (laughs). A.Because this was the first time I'd participated in production of the proper KH series, the number one thing was to know the KH series. I built up the imagery by doing things like checking the materials and retake points and rechecking the parts staff who had experience with the series fixated on. A.In the designing stage there was the feeling that Meow Wow had such a big impact that maybe the other Spirits wouldn't stand out... but, in practice when we saw the Spirits moving around on the game screen, I think we made each one lovable. A.Quasimodo. He was the first character I handled working on this title, so I have strong attachment to him, but I also felt the most personal growth from him, and with both his strengths and weaknesses mixed together I really liked how human he was. A.Kuma Panda. I can hardly handle its carefree atmosphere and gentle eyes. A.The character expressions move quite a bit in cutscenes. Also, there are a great many polygons assigned to the eyes of the Dream Eaters, we made them able to blink. I think because of this we made them possible to have expressions that are cute and full of life. Unfortunately it's not possible to check this in-game, but in The Grid in Side: Sora, during cutscenes the anchor-hook that Quorra uses has a gimmick where it's stuck in the floor in anchor state and the hook part then opens. Q. What part of this title did you fixate on particularly? A.The humanoid characters have bodies that lean towards KHI with heads changed to lean towards KHII in size. Making their heads smaller than they were in KHI makes them feel more realistic. Also, the fact that this title can be viewed in 3D meant I fixated on every detail of their hair and accessories, trying to reproduce as closely as possible a solid-feeling form of the design plans and original films. We were able to use about 5-10 times more polygons and ‘bones' to make the characters move compared to KH Re:Coded, and on top of that we were able to make a different model for use in cutscenes than the polygon model the players move, so I felt like my work was worthwhile. A.I have a deep attachment to the characters from The Grid. When we started work the film was still in cinema and there was no DVD, so until halfway through development we were still groping around, doing things like going to the cinema to take a look, so it was very difficult. But when we had the actors that appeared in the movie take a look at our completed models they said they were wonderful, and we were very happy. 3D films feel even more real, so I'd love for everyone to see it too. A.I like Meow Wow. The pokeable little body and the way it rolls around when it's happy make my level of comforted-ness zoom right up. Then, when I saw the design plan for Me Me Bunny I thought, I want to do the polygon model for this myself! Unfortunately I wasn't put in charge of it, so I kept glancing over at where the other staff were making it and feeling comforted (laughs). In this title, the polygon models used for the cutscenes were made to be able to move their tongues. Like this, Axel and Roxas can now lick ice cream. Unfortunately, though, we didn't use it in the actual scene. Q. What was the concept for the battles for this title? A.‘Refreshing-feeling movement'. I think action games will become more and more speedy and free after this. I personally like games that aren't like that too, though. Q. How did you adjust the balance of the strength of the Spirits? A.I made a macro in a spread sheet application that calculated parameters from a simple graph comparing the status of each Spirit. By just moving the graph I could easily change the strength of the Spirits, so I had an enjoyable time adjusting things. A.The battle with Young Xehanort. I wanted to use his ability to manipulate time to make a battle entwined with drama, so that's how I decided to have it develop. No matter what you do, Ana Mogurā won't come out of its hole. It's a glued-down-type Dream Eater that will absolutely not leave the ground and walls. That's because if it were to leave the ground it wouldn't be much of a mole now would it! The reason it doesn't have a lower half of a body is not because of cutting corners or cutting costs. Definitely not. A.I bore in mind to try and make many behaviour choices for both enemies and allies. I will be so happy if you can feel a high degree of freedom in being able to test everything in each place. A.The Dream Eater's AI. I adopted all-new elements like putting in characteristic behaviour with no direct relation to battle and the like, such as being happy when their own attacks land, and making the AI get cleverer after becoming close friends with Sora and Riku. 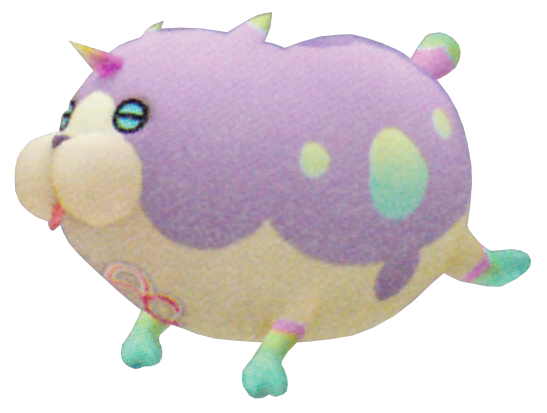 Also, Dream Eaters are modelled after real animals, so while their behaviour can be guessed from their outward appearance and characteristics, like perhaps a sheep would sleep, or an amphibian would be poisonous, I also adjusted things to give them a twist. There are many hidden attacks and behaviours only seen from either the Nightmare or Spirit version of a Dream Eater, so please by all means get close to them and change their personalities in many ways, and find the Spirit you like. Q. Were there any ideas for link attacks that were cut? A.There were lots. You and your Spirit clotheslining the enemy, transforming with your Spirit into a giant robot, kicking the enemy at the same time as your Spirit in a Sky--b Twin Shoot etcetera, etcetera. Q. What do you want to challenge yourself with when you work on the next title? A.I want to try and put into the KH series my dream of many years, a casino. Of course, halfway through development many Dream Eaters were cut to my extreme sadness. 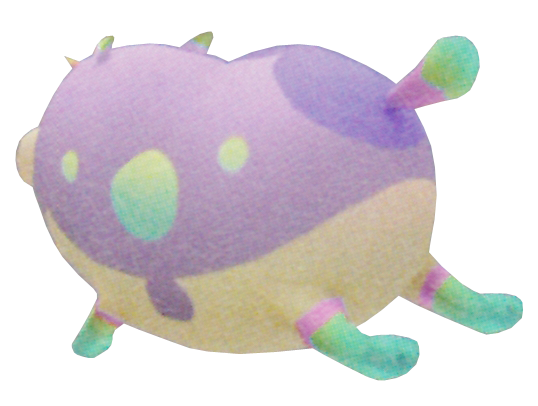 Among them was Hachi Queen, which began designed as a normal small-fry enemy and cut but made a miraculous recovery as a Dive Mode boss, which is rare to have happen. By the way, when it was small-fry it attacked by sitting in the eye of a needle and spinning like a top.